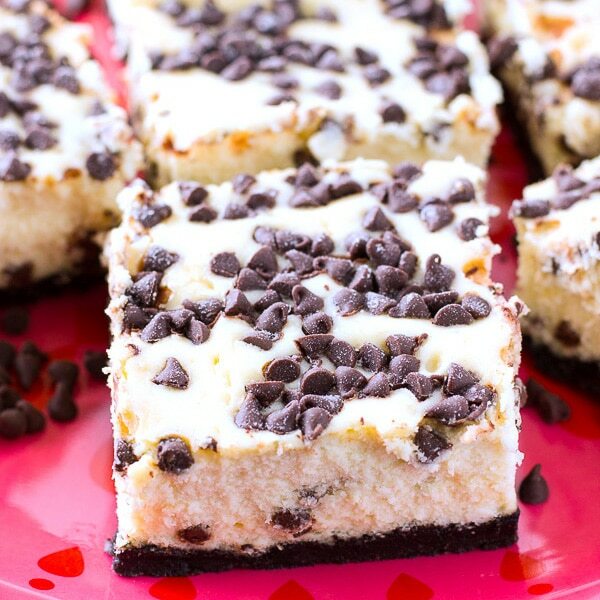 These Chocolate Chip Oreo Cheesecake Bars will make you forget that any other dessert options even exist. Y’all know I have a bit of a sweet tooth, right? And part of the perk of being an adult means that I get to “justify” eating my dessert for any meal and at any time of the day. Right?! 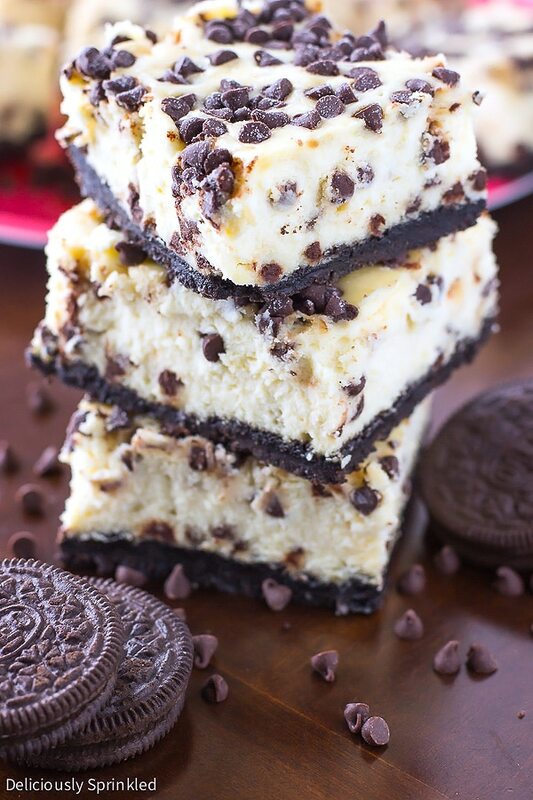 When it comes to these Oreo Cheesecake Bars….my taste buds literally crave them all the time. I KNOW that they are meant for dessert after meals…but what harm is a little sneak bite and taste here and there? Cooks are always supposed to taste-test their food before serving to others, right? The combination of Oreo and cheesecake is out of this world. Like, crazy good. I’m typically a “plain” cheesecake kinda girl, but this recipe broke that rule with ease. And who doesn’t love Oreos? That flavor and taste can’t be denied! 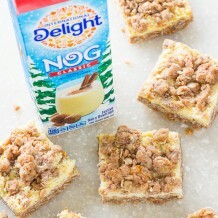 Once my family and friends found out that I had this dessert recipe gem hidden up my sleeve, the requests came pouring in for this to be my new go-to holiday dessert dish. And this is one dessert request that I’m 100% fine with! ● OREO COOKIES: 1 regular sized package of Oreo cookies. ● BUTTER: 1/2 cup (1 stick) unsalted butter. ● EGGS: you will need 3 large eggs. ● VANILLA EXTRACT: just 2 teaspoons of vanilla extract. ● FLOUR: 1 teaspoon of all-purpose flour to coat mini chocolate chips with so that they don’t sink to the bottom of the cheesecake when baking. PRE-STEP: Preheat oven to 300F degrees. Line a 9 x 9-inch baking pan with aluminum foil, leaving enough overhang on the sides. Spray with non-stick cooking spray. Set aside. CHOCOLATE CHIPS: To prevent the mini chocolate chips from sinking to the bottom of the cheesecake, I like to toss the mini chocolate chips in about 1/2 Tablespoon of flour before I add them into the cheesecake mixture. 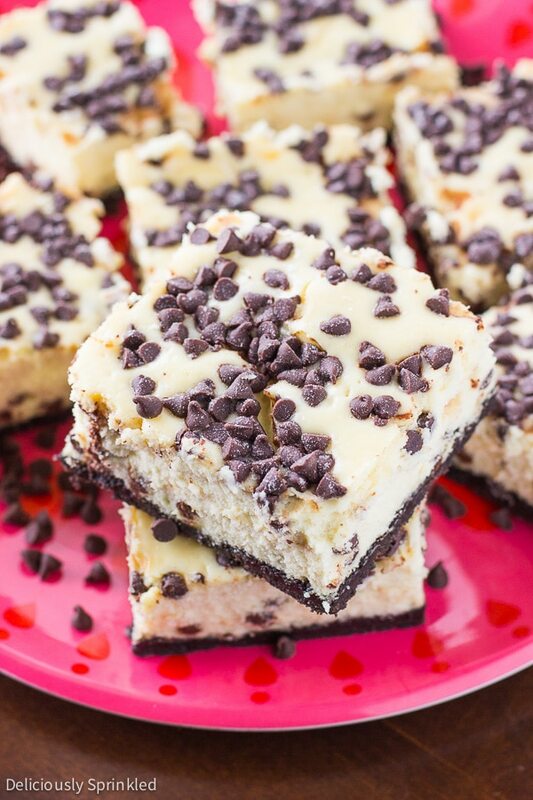 I also like to toss the mini chocolate chips I’m using to sprinkle on top of the cheesecake in about 1/2 Tablespoon of flour, so they don’t sink into the cheesecake too much, I like them to just sit on top of each cheesecake bar. 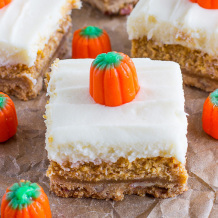 LINE YOUR BAKING PAN: To make it super easy for you to cut these cheesecake bars into squares, line your 9×9 inch baking pan with aluminum foil, leaving enough overhang on the sides and spray the foil with non-stick cooking spray. Once the bars have chilled for at least 1 hour, lift the bars out of the pan, folding down the aluminum foil sides. Then use a sharp knife to cut the brownies into squares. SUPER EASY! THICKNESS: If you don’t want as thick of cheesecake bars, you can use a 9×3 inch pan instead of the 9×9 inch pan I used to make these bars. Either way, they will be delicious! 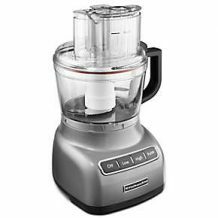 FOOD PROCESSOR: Using a food processor makes making the Oreo crust super fast & easy. 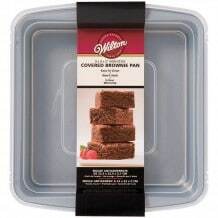 9 x 9 BAKING PAN: This is the baking pan I used to make these cheesecake bars. Preheat oven to 300F degrees. Line a 9 x 9 inch baking pan with aluminum foil, leaving enough overhang on the sides. Spray with non-stick cooking spray. Set aside. Using a food processor, pulse Oreo cookies and butter together until crumbly. Press cookie crumbs onto bottom of prepared pan. Set aside. 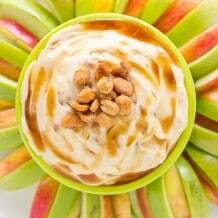 Using an electric or stand mixer, beat cream cheese until light and fluffy. Add condensed milk and beat until smooth. Add eggs and vanilla extract. Mix well. In a small bowl, coat 1/2 cup of mini chocolate chips in the flour. Mix coated mini chocolate chips into cream cheese mixture. Pour cream cheese mixture into baking pan. Sprinkle the remaining (non-coated) mini chocolate chips on top of cream cheese mixture. Bake for 1 hour or until cheesecake springs back when touched. Let cool at room temperature. Chill in fridge for at LEAST 1 hour before cutting into squares. 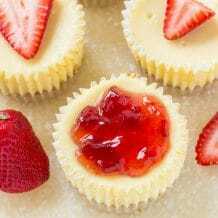 I have made a cheesecake similar to this previously. I would definitely make this in a 13×9 pan. The bars were thick enough. Great flavor! If I wanted to make this in advance, how many days would be appropriate? I would say no more then 2 days in advance! Enjoy! So after making this recipe 4 or 5 times I figured I’ve gotta make a review. ITS AWESOME!! I’d say this is probably tied for number 1 cheesecake at my house. I’ve had people that I hardly know try a bite and then request to pay me to make it for their birthday, it’s THAT good! Just make sure you cook it long enough, I made that mistake the first time. Just made this, I would definitely use a 9×13 next time. I used 9×9 and the crust was super thick and the filling went to the very top of the pan. They are baking now and look great but I think they would work out better in a larger pan. I moved to Australia and their packs of Oreos would be about 1 row in the states. So I would need 3 packs then right? I made this in a 9×13 and they look like they are ok. Took them out around 50 mins. Thanks for the recipe! Hello, Just wondering if parchment paper would be fine instead of foil for lining? Making this for my sisters Birthday with few tweaks by request. Thank you for the recipe! If I only have 2 packages of cream cheese, will it be fine? Unfortunately, you need to use 3 packages of cream cheese for this recipe to work correctly. I made these bars they are wonderful!!! Do you happen to know the nutritional value such as fat, sat fat and calories? I have never made these cheesecake bars in a 9×13 inch pan. But I would say, bake for 40 minutes. Will an 8×8 pan work as well? I thought I had a 9×9 and can’t seem to locate it anywhere in my house. Sweet or semi-sweet chocolate chips? 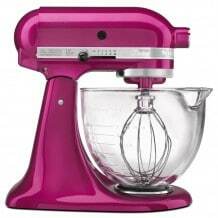 I do not have food processor but have stand up mixer. Could you use blender to pulse cookies and butter? I make this into little cupcakes. Start checking them after baking for 30 minutes. Do you recommend melting the butter for the crust? Or room temperature? Or cold? They look so delicious, I can’t wait to try them! These look so good! 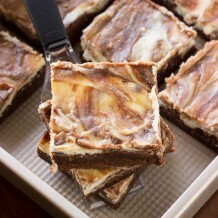 I LOVE cheesecake bars! I may need to look into moving so I can be your neighbor (and taste tester). These look so good, Jenn!! I love that these are super-impressive, yet still simple to make! I have a hard time resisting anything with mini chocolate chips, and these bars are no exception. I’m making this over the weekend! These look incredible! Can’t go wrong putting chocolate chips in cheesecake! Everything I love! 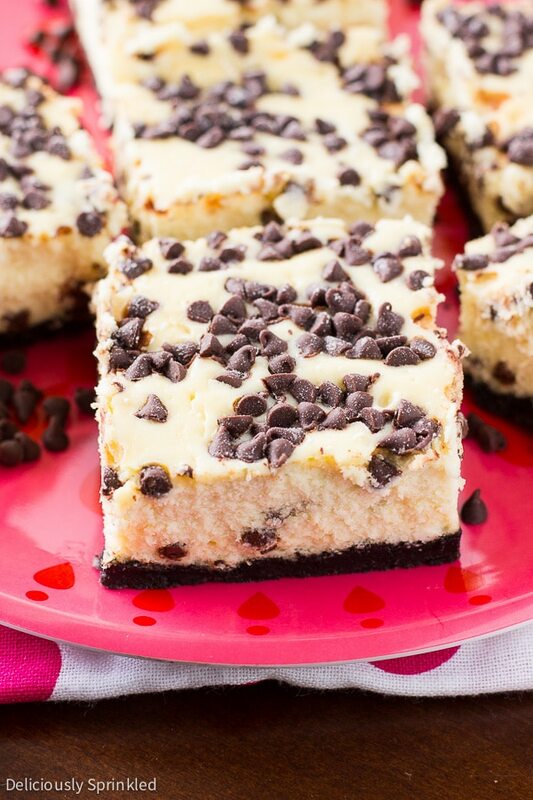 Chocolate Chips + Cheesecake?! I am in! These bars look so amazing, Jenn! I would devour the entire pan! 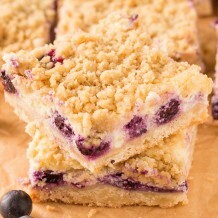 I love everything about these bars, they look fantastic and such great baking tips too! These bars have everything I love! They look delicious, Jenn! Mmmmmmm…… These look soo good and chockfull of chocolate chips!